the Northern Worker: Teacher Strikes: New Beginning for Labor? North Carolina teachers capped off two months of unprecedented national teacher militancy as they rallied 20,000 strong at the state capitol on May 16. During their one-day “sick leave” strike, the teachers closed down 40 local school districts with one million students. 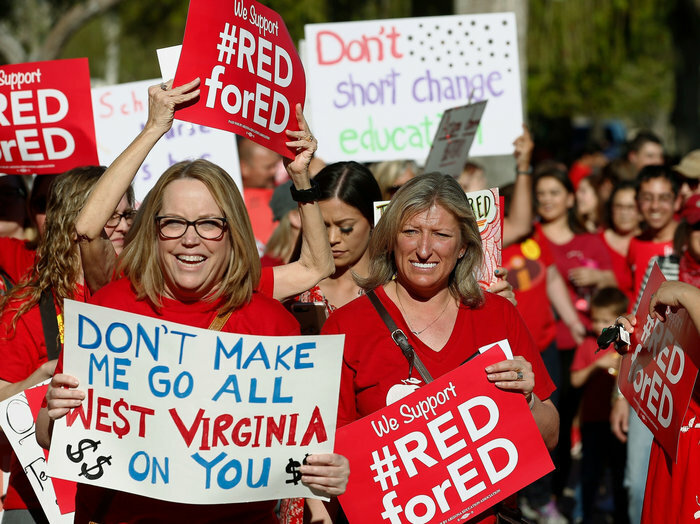 As with the previous five statewide teacher strikes in 2018, beginning with West Virginia in March and continuing in Kentucky, Arizona, Colorado, and Oklahoma, North Carolina teachers struck in defiance of a state law banning strikes. Collective bargaining in North Carolina is similarly outlawed, but as with the coordinated strikes in other states where legislation bars teachers from negotiating the terms and conditions of their employment, teachers are learning that their capacity to improve their lives and public education derives directly from their collective, defiant, and statewide power in the streets in alliance with parents and school workers rather than pursuing negotiations at isolated local bargaining tables where school boards are increasingly starved for funds. Needless to say, no politician, court, or legislative body chose to enforce these anti-strike laws, calculating that punishing poor striking teachers and/or their unions would only deepen their commitment to struggle against, if not defy, court injunctions until all threatened reprisals were withdrawn. In short, teacher power rendered reactionary laws in these largely “right to work for less” states unenforceable, a lesson not lost on the broader labor movement. That capitalist law is subordinate to workers’ power remains the central and guiding principle that brought unions into being in the first place. To date, every poll recording public attitudes toward striking teachers today indicates massive solidarity with these “lawbreakers”—66 percent support teachers among Republicans, 78 percent among independents, and 90 percent among Democrats—a broad reflection of the rapidly changing attitudes among workers more generally in a national context where broadside attacks on every aspect of working-class life is under bipartisan attack. As with the statewide strikes in this initial wave, North Carolina’s teachers demanded higher salaries for teaching and non-teaching personnel and increased funds for public education. Since 2008, North Carolina teachers’ real wages have fallen 9.4 percent. As with the other statewide actions, teachers pointed to public statistics demonstrating that teacher pay and funding for public education over the past decade has decreased by at least the same 9-10 percent, while state laws and budget allocations granting tax breaks and other benefits to the corporate elite and the super rich have increased in roughly the same proportion. Another key issue that has become integral to teachers’ concerns is the growing privatization of public education in the form of for-profit charter schools, which further siphon state funds from public education to private interests. The corporate-led charter school movement, led by billionaire “charitable” and “public-interest philanthropic” groups like the Bill and Linda Gates Foundation, has succeeded in channeling public funds authorized by state legislatures and local school districts into corporate hands. Expenditures for charter schools have doubled over the past decade and today account for nearly seven percent of state education funding. Driven by the spurious arguments that public schools are failing due to incompetent teachers, teacher tenure, and other reactionary notions with racist overtones, the charter “movement” has proven incapable of presenting significant evidence that privatized charter schools achieve better results for students than the public school system, however much the latter has been starved for funds. Indeed, it is. Coupled with a major increase in neighborhood segregation patterns driven by large income disparities and inadequate funding for poor districts, especially in large urban centers, as well as charter school entrance requirements and selection procedures, public schools today are perhaps more segregated than in 1954 when the Supreme Court’s Brown v. the Board of Education of Topeka, Kansas ended the “separate but equal” and racist “legal” segregation of that era. Class-conscious educators are quick to note the deepening “school to prison” scenario wherein Black and Latino youth from poor and racist police-oppressed neighborhoods are channeled through depressing and dilapidated schools into the increasingly privatized for-profit prison-industrial complex. In Arizona, per-student funding has fallen 13.6 percent since 2008, while corporate tax rates in 2011 alone were cut by 30 percent. Oklahoma legislators approved multiple rounds of tax cuts for the rich beginning in the mid-2000s, while reducing per-student funding by 28 percent since the 2008. Teachers there just won their first raise in 10 years. In North Carolina, the corporate tax rate has been trimmed by more than half in the last five years. In 2013, it was 6.9 percent; this year it is 3 percent, and the Assembly voted to drop it to 2.5 percent next year. The cuts cost the state treasury over $600 million a year, which could otherwise be going to education. Moreover, over half of the tax savings went to people earning more than $500,000 a year, while working people received next to nothing. Roy Cooper, North Carolina’s Democratic Party governor, presented a plan to “freeze” tax cuts for corporations and those making above $200,000, while giving teachers an 8 percent average pay increase, with some receiving raises as high as 14 percent. “It is tax fairness for teacher pay,” Cooper said. A year ago, the newly elected Cooper vetoed the budget bill passed by the North Carolina General Assembly, stating that the tax cuts it offered wealthy corporations were too large, and that it did not offer enough to teachers and state employees. However, the Senate overrode his veto. This year, on June 1, the Assembly voted to continue to cut corporate taxes in 2019 but accepted the governor’s proposal for a raise for teachers. It remains to be seen whether Cooper will veto the bill. With mid-term legislative elections approaching, the North Carolina governor has been more than willing to assume the role of liberal teacher advocate. He understands that the teachers’ struggle has given the Democrats a popular issue to identify with. Yet there’s no doubt the same “liberal,” as with his posturing counterparts across the country, will find common ground “across the aisle” with Republicans when push comes to shove. It would be a serious mistake for teachers to bind their struggles to the electoral campaigns of the Democratic Party—which has betrayed them countless times. It oversaw much of the massive defunding of education during the Obama administration. Unfortunately, the top leaders of the teachers’ unions have thrown in with the Democrats once again. As the summer recess begins, leaders of the 1.9 million-member American Federation of Teachers (AFT) and the 3 million-member National Education Association (NEA) are making plans to enter the political arena with the objective of electing “liberal” Democrats who they argue will ensure adequate funding for public education. Indeed, the two national unions have announced plans to join together to run some 400 teachers in the upcoming election cycle, undoubtedly all as Democrats. Over the recent decades, in a world context in which U.S. and world capitalism are in perpetual crises, the ruling rich envision no way out other than at the expense of workers, not to mention via endless wars for plunder and profit and every form of environmental devastation. Weingarten’s mentor in the 1970s and afterward was the reactionary pro-war racist AFT national president and New York City United Federation of Teachers Local 2 president Albert Shanker. It was Shanker who shackled the AFT hand and foot to the very New York State legislators who approved the infamous Taylor Law, which prohibited teacher strikes. Nicknamed the RAT law after its initiators, N.Y. State Senate and House leaders Nelson Rockefeller and Anthony Travia, the law, still in effect today, provided for fining striking teachers in the amount of “overtime in reverse,” that is, the forced deduction from teacher paychecks of a day and half pay for every day teachers struck! Weingarten’s proclamations about Occupy notwithstanding, the AFT leadership has always supported the candidates and party of the “one percent.” And it was Obama’s Democratic party that engineered the wars in the Middle East aimed at setting back the Arab Spring in order to re-impose the dictatorships that the Arab Spring mobilizations sought to challenge in Libya and Egypt. Her reference here was to state legislators in Oklahoma who have already repealed taxes on hotel and motels that were passed to pay for teachers’ raises. In Tucson, Ariz., teachers are finding out that due to previously unknown state funding formulas they won’t be receiving the 9 percent raise that they were promised when they ended their strike. Teachers have won some significant pay raises for themselves and other state employees. They have solidified support for their cause by championing and winning school funding increases, but their grievances have not been fully addressed. Oklahoma passed its first tax hike in 28 years to raise $450 million in new education funding, but legislators balked at reinstating a capital gains tax they demanded. Instead, the state approved new regressive taxes on cigarettes, oil, and gas that primarily are paid by working people and not the wealthy. In Arizona, teacher pay will be raised 20 percent by 2020, but the legislature has refused to restore school funding to pre-recession levels. The state has yet to come up with a plan for paying for the raises, and teachers fear that their pay hikes will accrue from state budget funds earmarked for Medicaid and other social services accounts. It is fair to say that round one in the emerging national battle initiated by outraged and united teachers has been a resounding but far from definitive victory for teachers and their allied school workers and students. The coming school year will reveal whether a class-struggle leadership core will emerge, crystallize, and make its mark locally and nationally in the now radicalizing teacher-union movement. A positive indication of a shift in this direction is the initiative of the leadership of the Oakland Education Association in Northern California. OEA leaders have set Saturday, June 9, for a regional teachers’ meeting at Oakland Technical High School. Entitled “Lessons from the Red State Rebellion: What Can California Learn?” the free public forum is co-sponsored by the San Francisco United Educators, the Berkeley and Richmond teachers’ unions and the community college-based Peralta Federation of Teachers. The organizers have secured an auditorium with a capacity of 800 to hear reports from their teacher peers in West Virginia, Arizona and Kentucky states where rank-and-file teachers, including a number of organized socialists, played a leading role preparing the organizational and political groundwork in the year leading up to their successful statewide strikes. It is no coincidence that the OEA leadership initiated this meeting. This often militant union has engaged in five major strikes over the past decades, likely the largest number in the nation’s history. The June 9 meeting takes place in the context of the union’s leadership having declared an impasse in their negotiations with the Oakland Unified School District, thus opening the door to the possibility of a sixth strike in the months ahead. The direct and organized cross fertilization of fighting “red state teachers” flush with important victories with beleaguered “blue state” San Francisco Bay Area teachers and staff bodes well for future coordinated California or nationwide struggles, a first in a state whose Democrats totally dominate the state legislature and endlessly tout California as “the fifth richest ‘nation’ in the world.” But California’s Gross Domestic Product aside, the “blue state’s” educational system ranks among the lowest in student achievement levels, and its teacher salaries—relative to the cost of living in the area—are not much different from that of their “red state” sisters and brothers. Teacher power exercised in the streets at state and regional levels, if not nationally, coupled with their independent organization in the political arena through a fighting trade-union-based labor party inclusive of the broad labor movement and its allies among the oppressed nationalities, would represent a historic and permanent gain for working people across the country. Such a political class break from the twin parties of capitalist war, racism, and plunder can only emerge from the kind of fighting formations we have witnessed among teachers over the past year. They have taught some invaluable lessons that will not be lost on the rest of the organized labor movement and on the yet to be organized militant working-class forces that will inevitably enter the class-struggle road in the period ahead. >> The article above was written by Jeff Mackler.